It was great when we started referring to Barack Obama as the “food stamp president” — and such a fitting title for the current head of the White House. Unfortunately liberals eat up government dependency, and they started wearing the new phrase as a badge of honor. 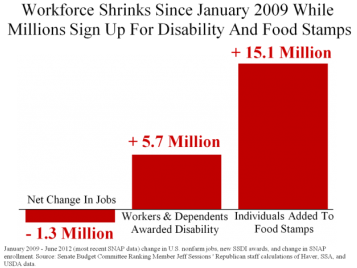 Food Stamps was at 26 million people in 2007 — 26.3 million. In the last five years, that’s gone up to 46 million people. In other words, Food Stamps works. … He is the “food stamp president.” That’s great! … We have 16 million people on Medicaid going forward — 16 million more people added — and we’ve trying to have that happen since 1965. Increased reliance on safety net programs is neither a founding pillar of our country nor a fiscal accomplishment. The stated purpose of safety nets is to catch people from falling to the ground in worst-case scenarios. Safety nets are not supposed to permanently house people who will lay in them like hammocks. So, just how bad has the food stamp problem become? The Weekly Standard reported an interesting discovery about two weeks ago. Jeff Sessions, a ranking member of the Senate Budget Committee, urged his staff to look into food stamp data. The team’s graph is a perfect representation of why Obama’s policies don’t work. From January 2009 — when Obama took office — to June 2012, the net change in jobs was -1.3 million (i.e., 1.3 million Americans have lost their jobs overall). And, in that same period of time, 15.1 million people signed up for food stamps, totaling 46.7 million recipients nationally. Statistics in Vilsack’s letter indicate that the number of legal non-citizens participating in SNAP increased approximately 190 percent from 2001 to 2010 . . . The partnership also includes a campaign to counteract feelings of pride and self-reliance, traits that used to be respected in early America. Author David Beito details this classical stigma toward receiving government aid in his book, “From Mutual Aid to the Welfare State.” The private fraternal societies of the late 18th and early 19th centuries fostered a strong sense of community that easily and efficiently allocated resources to those who needed them most. Comparatively, government programs hurt the poor in the long-term, destroying communities and families alike. Between 1966 and 1980, the proportion of poor households headed by a person who did not work at all during the year rose from 39.7 percent to 49.6 percent. For female headed households in poverty, 61.5 percent of the household heads did not work at all in 1980, up from 52.7 percent in 1966. Thus, while the labor force participation of all females was climbing, the rate for poor females was declining. To put it simply — if you want to “pay” for the poor today, realize you’ll be paying a lot more for them in the future. It’s the same with food stamps, and it always will be. The rest of us realize the truth. Anyone that is wondering about our current "state of affairs" really needs to read this post. The chart regardless of the color or how it is portrayed is shocking to me. Not surprised but just shocking to see how it factors out. BHO is setting this country up to FAIL so that he can be promoted to Czar of the world. People please wake up and smell the coffee! We act like we are drugged or something! And yet when my husband and I were at our lowest, deciding if we were going to pay rent on time or buy groceries for the week, we didn't qualify for food stamps. People take the government for granted and Obama is making it quite easy to do so. Mitt Romney gives me hope that I can raise my daughter to be the best she can be in our great country!